Making a cartoon for a lizard tapestry this size is quite a process. First, I enlarge the photograph. 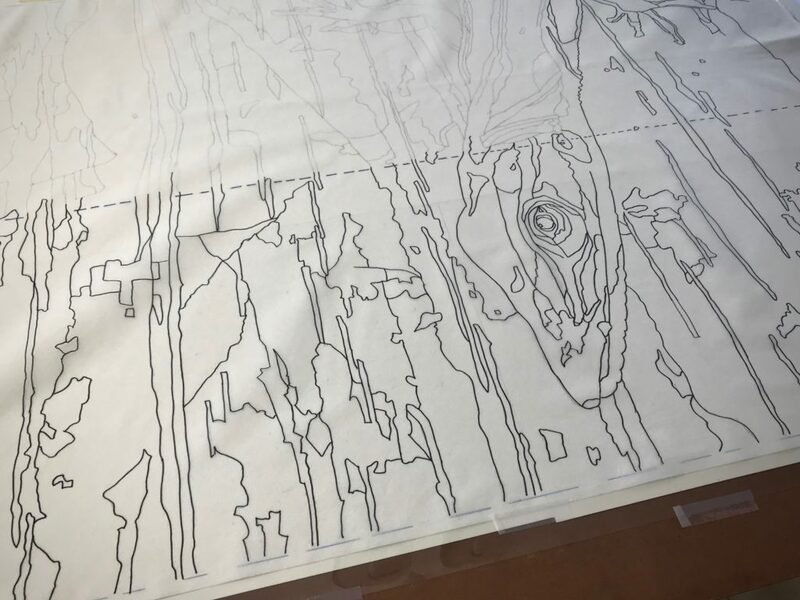 Then, I trace the outlines of the details onto a sheet of clear acetate. Next, to make the cartoon, I trace the bold Sharpie lines of the acetate image onto interfacing material meant for pattern making. But next time, it will be different. 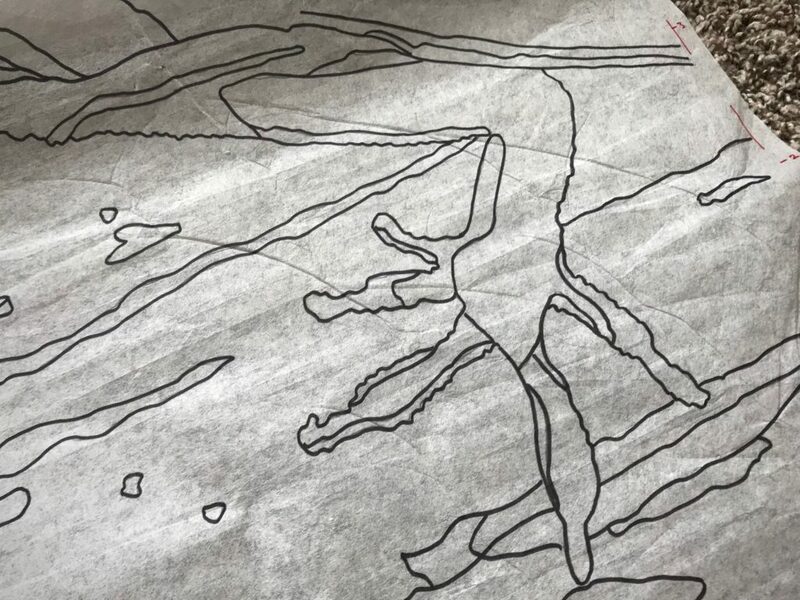 Tracing outlines from the enlarged photograph onto the sheet of acetate. Photo image on the iPad helps clarify which distinctive lines to draw. White poster board under the acetate makes the Sharpie lines visible. The interfacing material lays on top of the acetate so I can trace the lines to make my cartoon. I don’t plan to use this interfacing material again for a cartoon. It is not stiff enough. As the tapestry progresses it becomes more and more difficult to keep the cartoon from puckering and creasing in places. A better option would have been stiffer buckram, like I used for my transparencies. (See – Quiet Friday: Painting with Yarn and Animated Images.) But I am not able to find buckram in sufficient width. Interfacing material is susceptible to puckers and creases. Unevenness in the cartoon can result in a distorted woven image on the tapestry. 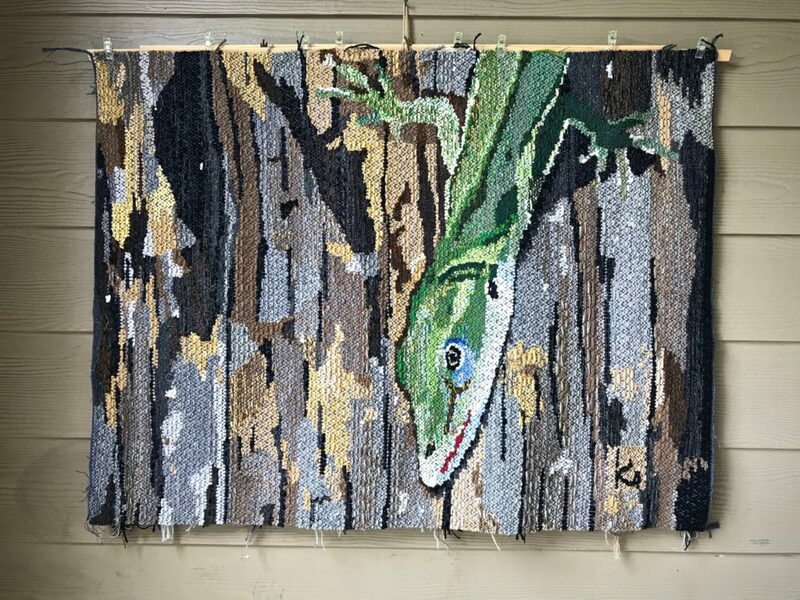 After I finished weaving the lizard portion of the tapestry, I decided to experiment. I removed the interfacing cartoon and switched to the acetate sheet instead. There’s no puckering with this one! 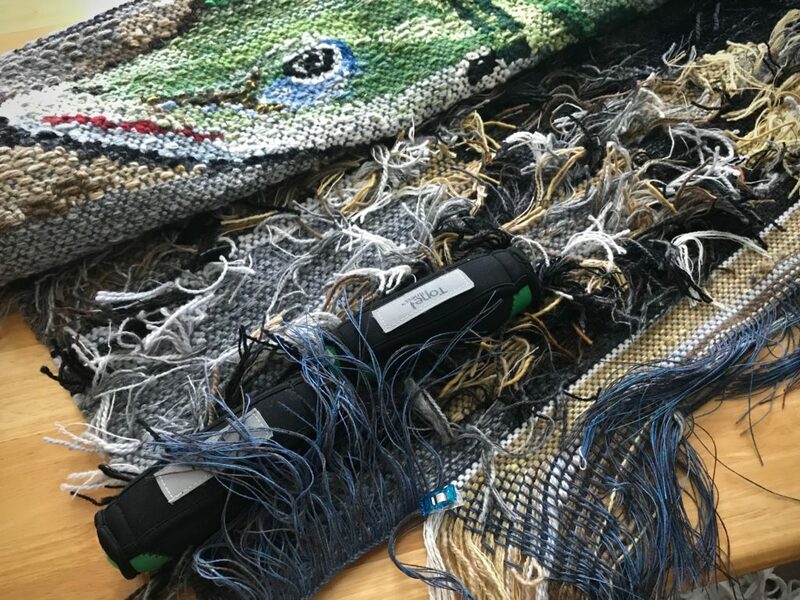 It is much easier to line up the cartoon with the weaving. It has drawbacks, though. Noisy! When I beat in the weft it makes thunderstorm sound effects. (Not so great for our temporary apartment life.) It’s also harder to see the cartoon lines. And the magnets I use to hold the cartoon slip out of place too easily. Slat holds the cartoon up to the warp. 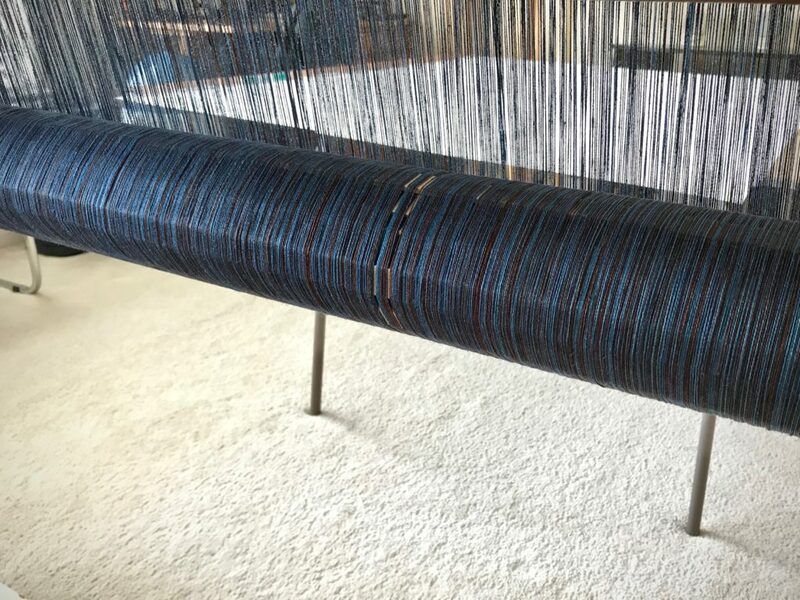 To beat the weft, I move the slat out of the way of the beater, just under the fell line. The sheet of plastic would be a good prop for making sounds effects for a film about a thunderstorm. Joanne Hall in her Montana studio. 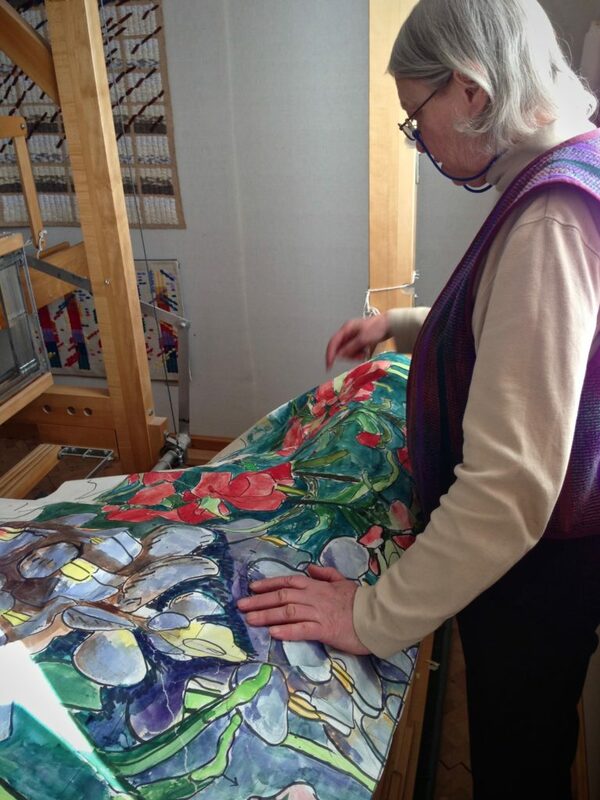 This is the cartoon she made for her impressive Bluebonnets tapestry that hangs on display in a Dallas hospital. May you learn from your experiments. My interest is always drawn to how things work. Tapestry is not an easy medium to work in. But, oh… Such beautiful results. Could the widths of the buckram be spliced together? May you continue to find new paths to explore. Hi Nannette, Yes, in hindsight I could have used the buckram crossways, and continued the pattern across the separate pieces. The other advantage I see with the paper is the ability to color the design, and work from that. I’d like to try that. I work across the tapestry a row at a time, starting and stopping many wool butterflies. It gets confusing. It’s not always easy to see how the particular colors in my butterflies relate to the details of this lizard. I closely follow the cartoon and the pattern key by my loom. I have to trust the cartoon more than what I see at the moment. 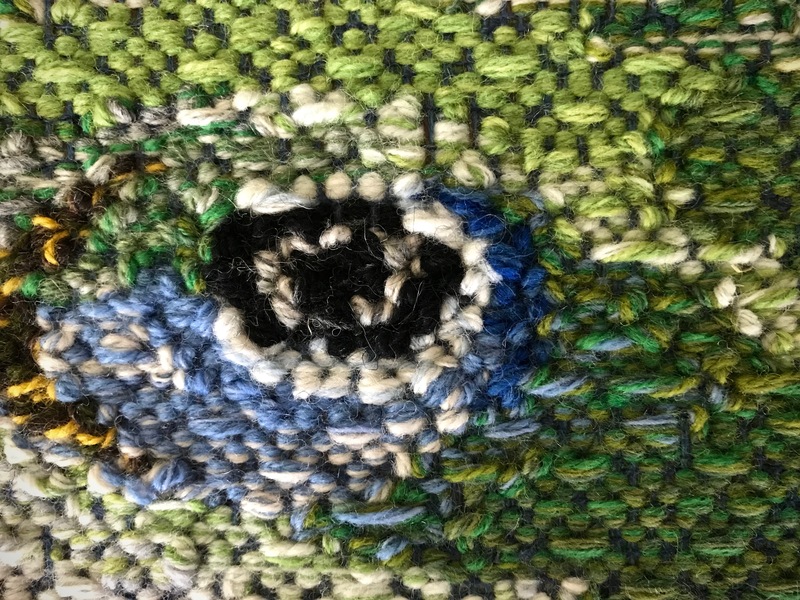 Lizard eye detail. There are many color changes in the rows that go right through the center of the eye. Every now and then, I climb up on a step stool as far as I dare. 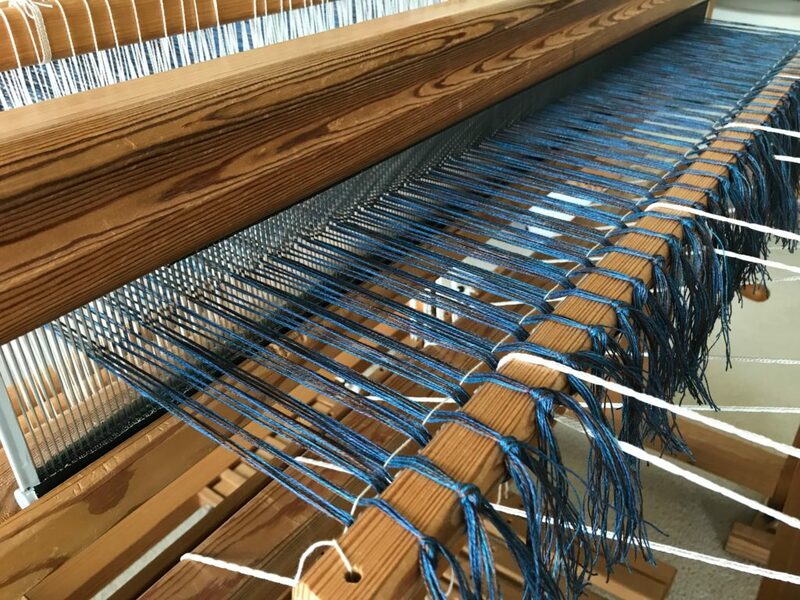 The view from this distance gives me a realistic perspective of the weaving. And raises my hopes that the lizard in this tapestry will indeed resemble the green anole that had posed for my camera. 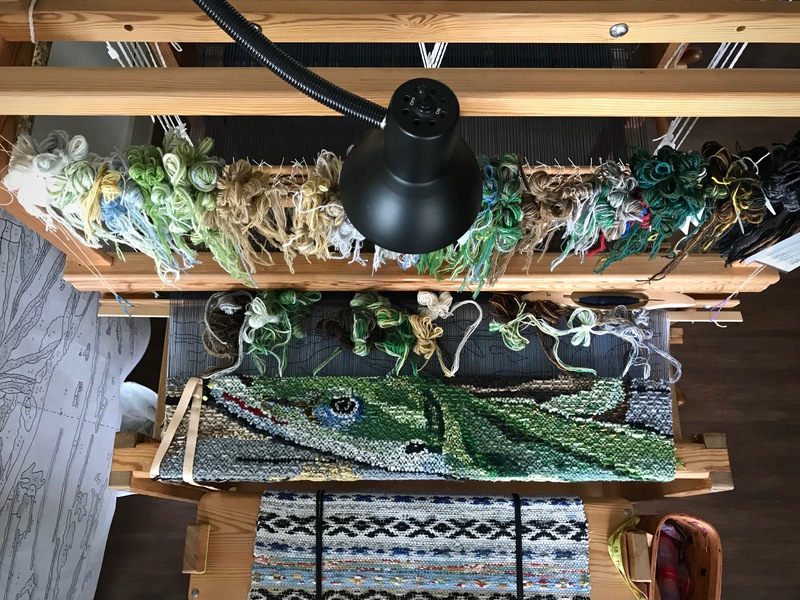 I am unable to see that same progress when I’m sitting at the loom with the lizard’s face right in front of me. 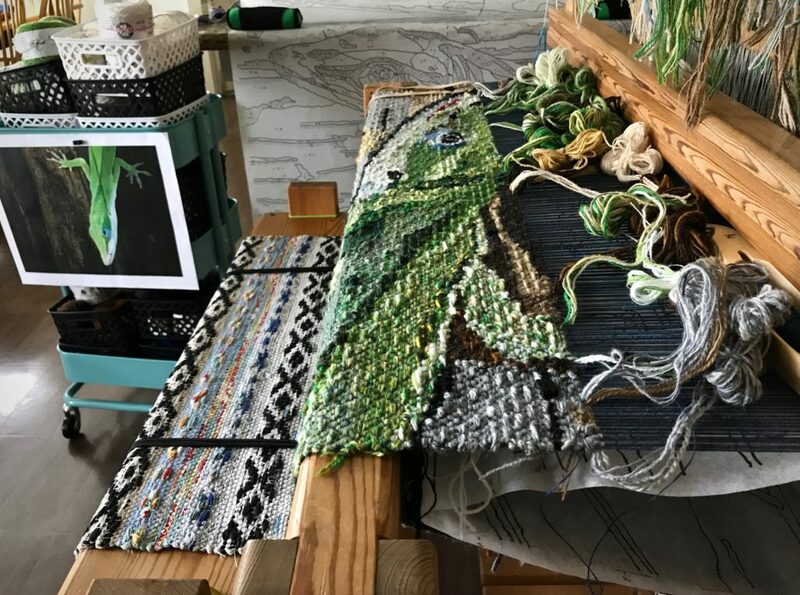 Pattern key at the left of the loom provides constant direction for weaving the details in the tapestry. View from standing on the top step of the step stool. 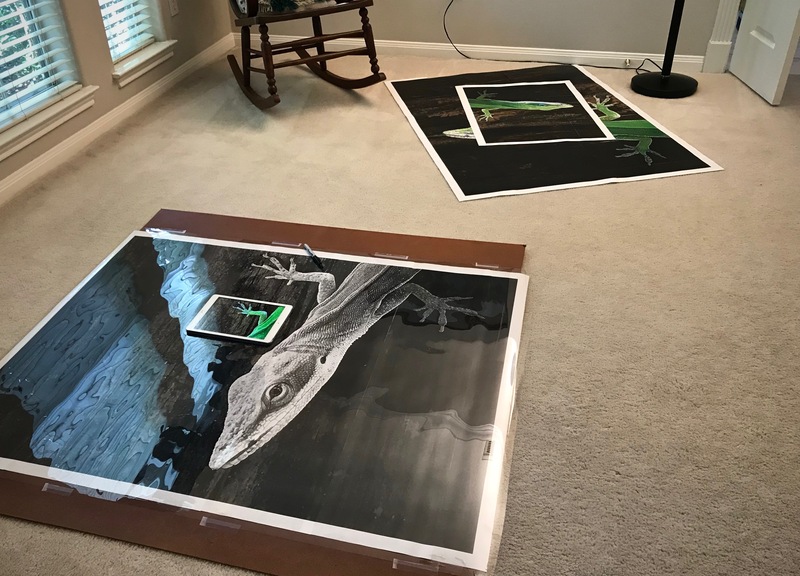 Enlarged photograph of the original green anole hangs on the cart next to the loom. When life gets confusing, it’s time to step up. Treasures are hidden in plain sight. Wisdom and knowledge are hidden like that. The treasure storehouse is in Christ. In him we have a heavenly view that gives us a realistic perspective of what we see in front of us. Trust his pattern key, and proceed with confidence. It’s not so confusing, after all. May you see hidden treasures. Hi Joyce, Have fun with that tricky warp threading! It is amazing what can be accomplished when you follow a plan. Hi Nannette, All the work done in advance really makes a difference. Thank you for encouraging us towards the truth of heavens perspective in Christ, of what appears to be life’s confusion now……I needed that reminder today. Hi Sandy, It’s a reminder I need frequently, too. Some things are better seen without color. 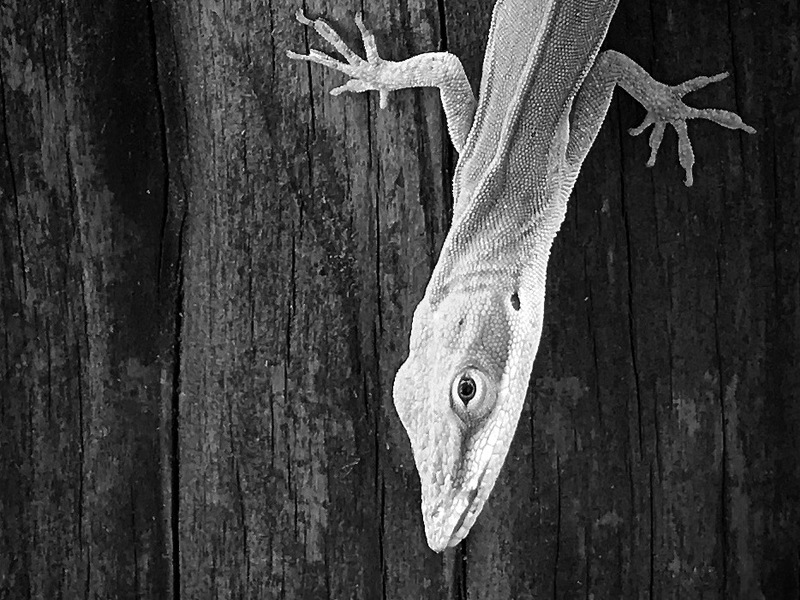 Hence, an enlarged version of my lizard in black and white. Variances in value are not as easily discerned in the full-color print. These subtle value distinctions bring realism to the lizard tapestry. For this reason, I sort all the yarn into small groups of color and value, which clarifies my choices for each wool butterfly. Lizard portrait in black and white shows nuances in color value. 1. 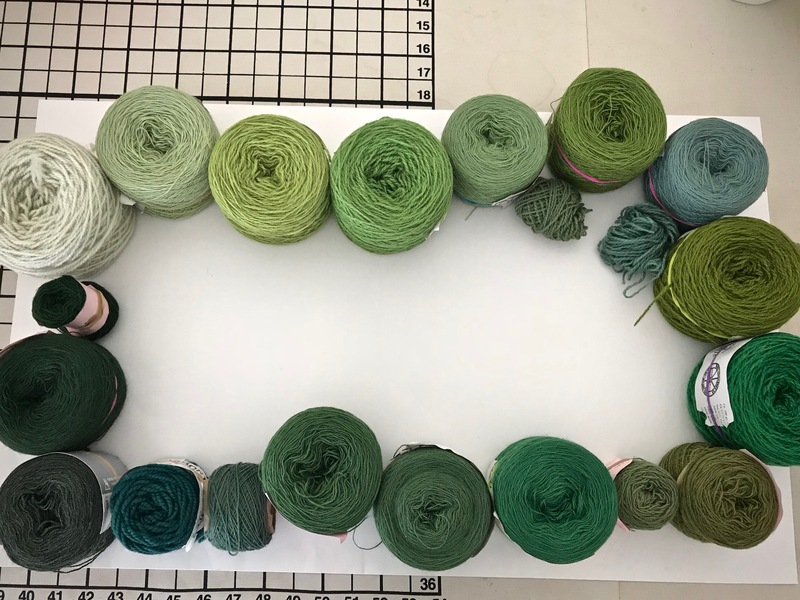 Select yarn colors for the tapestry. 2. Group like colors together. 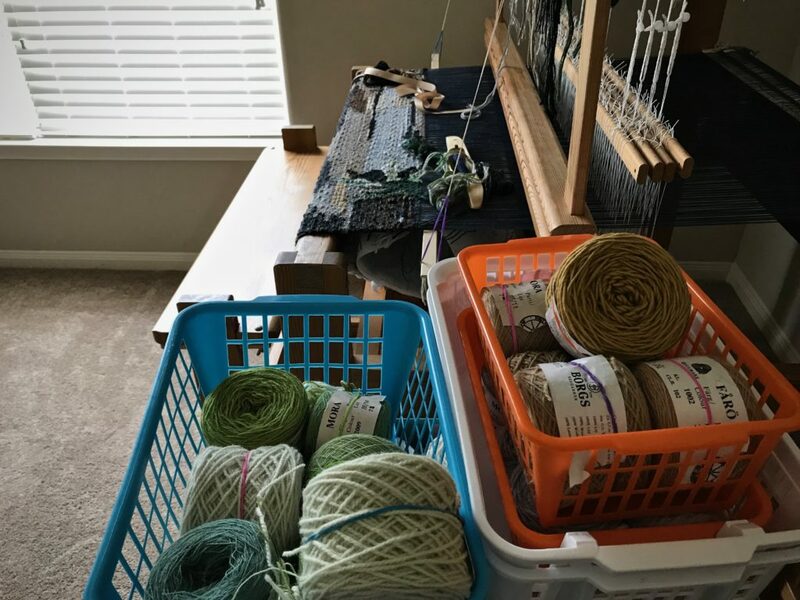 Wool yarn, much of which has been accumulated from previous projects. 1. 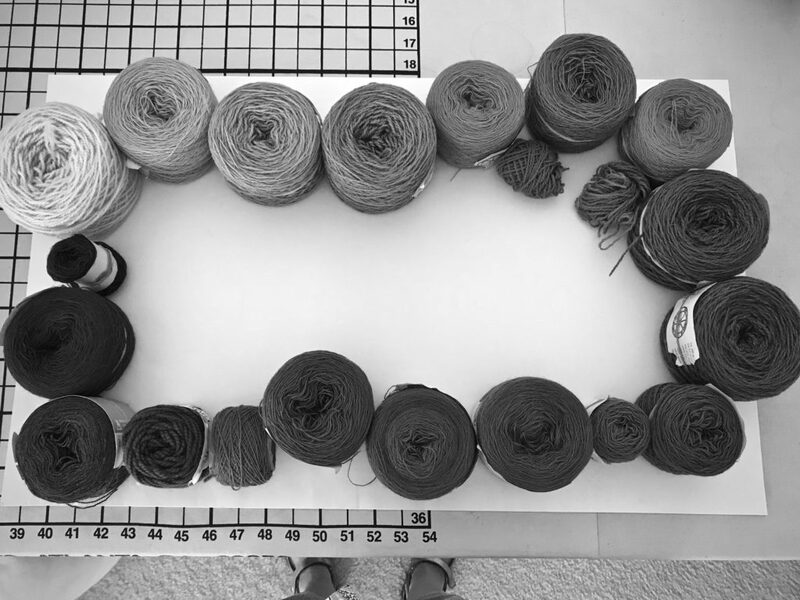 Arrange yarn on a white background in value order, from light to dark. Take a picture. Green, from light to dark. 2. Take another picture using the smart phone black and white setting (“Noir” in the filters on my iPhone). 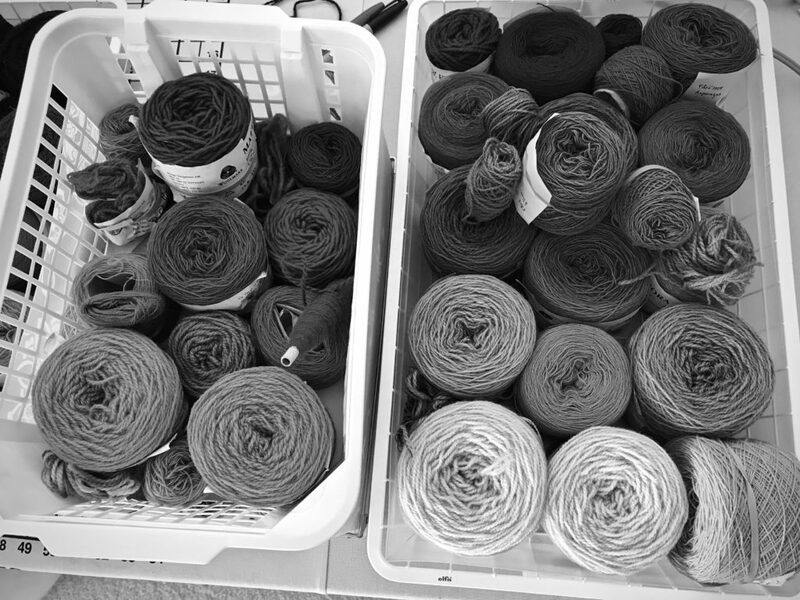 Photo shows that a couple adjustments are needed for the yarn-value order. 3. Adjust yarn to make value order corrections. 4. 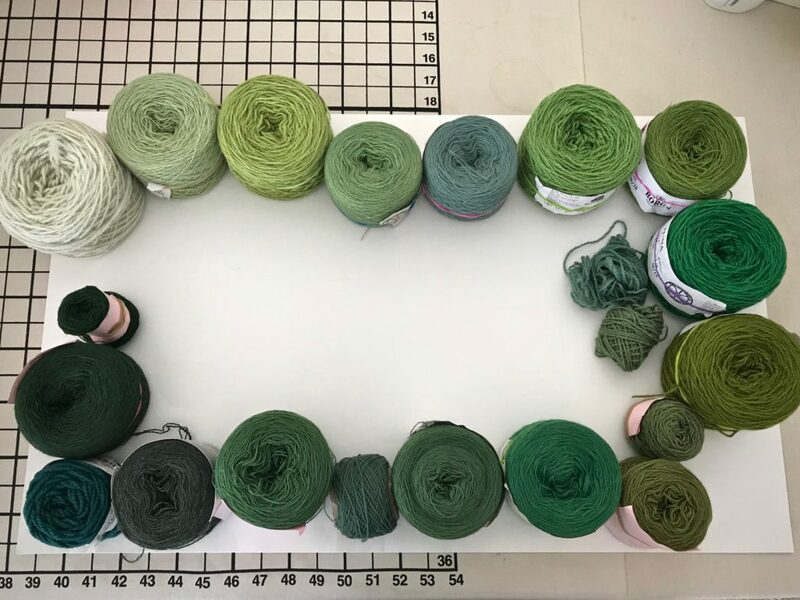 Divide the yarn into three value sections. 1. light, 2. medium, 3. dark. 5. 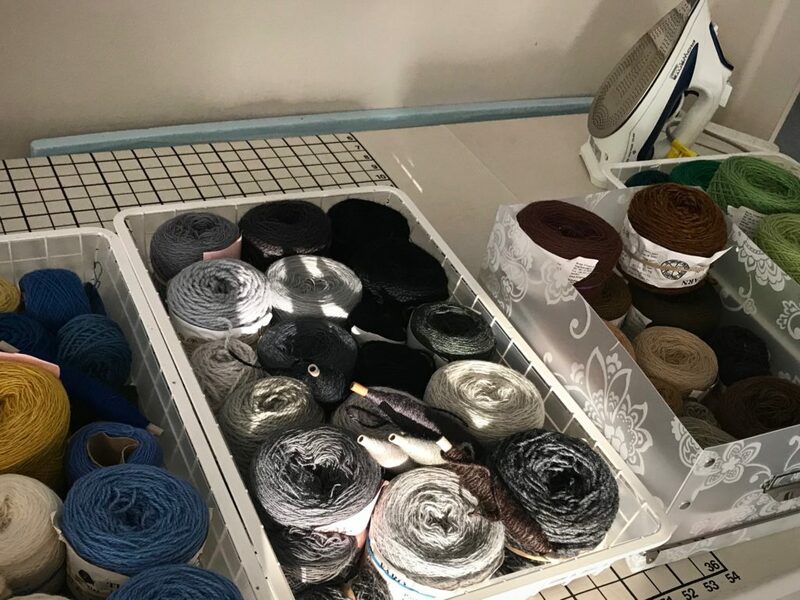 Label baskets to hold each yarn section; i.e., “G 3” for green, dark. The preparation for a project like this is immense. And tedious. 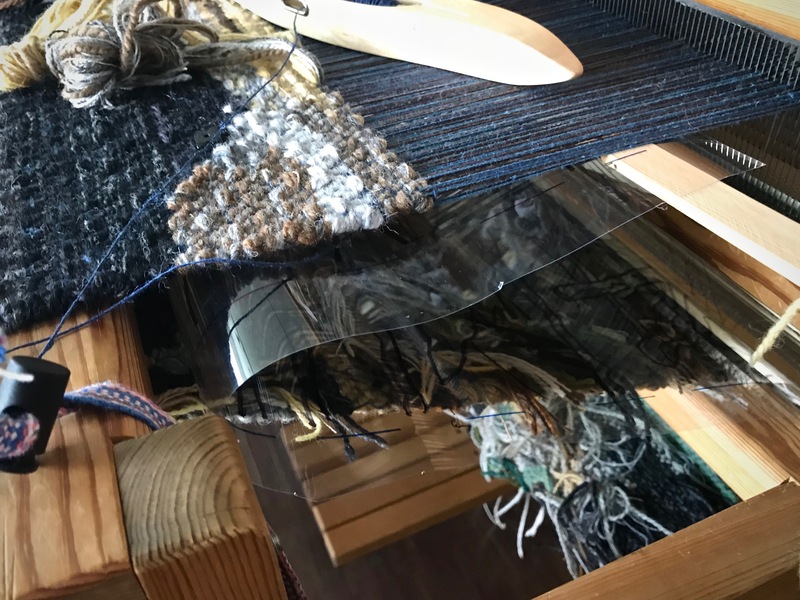 But this is a weaving adventure. Indeed, the results may very well be astounding. That’s my hope. Little baskets of yarn next to the loom, sorted by color and value. Life itself is a full color project. Immense and tedious. Rise above these earthly things. Our Grand Weaver sees the value distinctions that we miss with our natural eye. What hope this gives! Trusting him through this real life adventure brings assurance of astounding results. Setting my mind on these “above” things turns troubles into treasures whose values will be evident in the final real tapestry. I like the reminder of value distinction. I think it is hard to remember or believe that a life lived in quiet, following Christ teachings has just as much value as the life lived containing one grandeous moment of self sacrifice. Hi Annie, So true! Our callings may differ, but all those differences are needed to complete the picture. Now we know why the art teachers insisted on pencil before pastels. What a great visual. Thank you. I am going to step out of topic and call on you and your readers to pray for all who share the roads. We lost a young man the day before Fathers’ day. A woman turned left into his Harley. She was trying to go onto a highway on-ramp. Late morning… dry pavement… sun out… mind not paying attention to oncoming traffic. Please add all people in their daily travels to your prayers and care on the roads. His death shattered 3 families. Dear Nannette, That’s a heartbreaking loss. May you and the three shattered families find comfort in the Lord’s embrace.